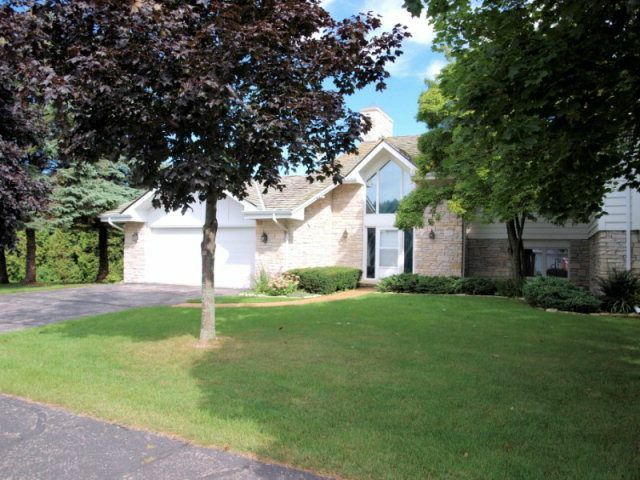 A very unique 3 bedroom, 2.5 bathroom condo/town home with many amenities not usually found in Door County condos. This a tastefully furnished end unit in a small six unit condominium project, located right at the southern edge of the Maxwelton Braes golf course, so it actually has the feel of a private home. Beautiful golf course views from most every window. Two story condo with enormous great room featuring a field stone wood burning fireplace, dining alcove with seating for eight, full kitchen, covered deck overlooking course, laundry room with washer and dryer plus a half bath all of the primary (second) floor. The first floor features a master suite with full bathroom, walk out to deck overlooking golf course, king sized bed and enormous walk in closet. Second bedroom features a queen sized bed and the third bedroom functions also as a sitting room, with queen sized hide-a-bed and walk out to covered deck. Perfect location for a family gathering or girls get away. Located only 2 minutes from Baileys Harbor, 10 minutes from Fish Creek, Egg Harbor and Sister Bay. Dogs are allowed at this rental.